Think you got a Neil Armstrong autograph cheap? This is the kind of Armstrong autograph that sells on the cheap -- a bad fake. Never say never, but the odds of winning an authentic Neil Armstrong or Apollo 11 signed item for way below market value in an auction format are exceedingly low. There are way too many collectors and dealers looking for Armstrong and Apollo 11 and trolling eBay 24/7. They are not going to miss an authentic Armstrong and let it go for way below market value. If it is in auction format, and you got it on the cheap, chances are you didn’t outsmart everyone else. Chances are it sold on the cheap because it’s a fake. You can get a deal on the rare occasion a seller significantly underprices an item and lists it as a Buy-It-Now. Then again… there are lots of trained eyes watching and you would have to hit it shortly after it’s listed. If it’s a low-priced Buy-It-Now and it’s been sitting there for a while… yep… chances are it’s a fake. In the Spring 2016 RR Auction Space Auction this Neil Armstrong signed photo sold for $38,467 with buyer's premium. This is an amazing result... and to my knowledge is, by far, the most ever paid for a single signed astronaut photograph. In my opinion, this is the quintessential image of the space program... the moment Armstrong stepped off the ladder onto the moon's surface. And, it is signed perfectly with an Apollo 11 inscription. There are only a few images of Neil Armstrong on the moon, and most were not readily available when he was freely signing autographs. Any lunar surface photo of Armstrong is uncommon. Lastly, this photo came directly from the family of the former head of NASA's photo division, so it has strong provenance. In fact, an original of this photo would likely have only been available to someone inside NASA in the late 60s and early 70s. Claudia Thames worked for John M. King, a Colorado oil and gas tycoon who befriended many astronauts. RR Auction's Spring 2014 Space Auction begins Thursday May 15 and runs through May 22. The auction can currently be viewed in preview. It was a pleasure reviewing all the amazing autographed items. Another great item is lot #302, an 10 x 8 photo of Buzz Aldrin standing on the lunar surface, taken by Neil Armstrong, and signed by Armstrong. Reverse of photo bears a National Archives credit stamp along the bottom, an affixed caption, and another stamp that reads, “NASA photo taken and authenticated by,” and signed underneath in black felt tip by Neil Armstrong. The most valuable astronaut signed photo? At Steve Zarelli Space Authentication, I review thousands of autographed astronaut photos every year. Also, as a collector for over 15 years, I have seen many, many more. So what is the most valuable and desirable single signed astronaut photo? Most people would probably assume it is a photo signed by Neil Armstrong. Armstrong unpersonalized white space suit portrait photos with a strong signature can fetch $5,000+. 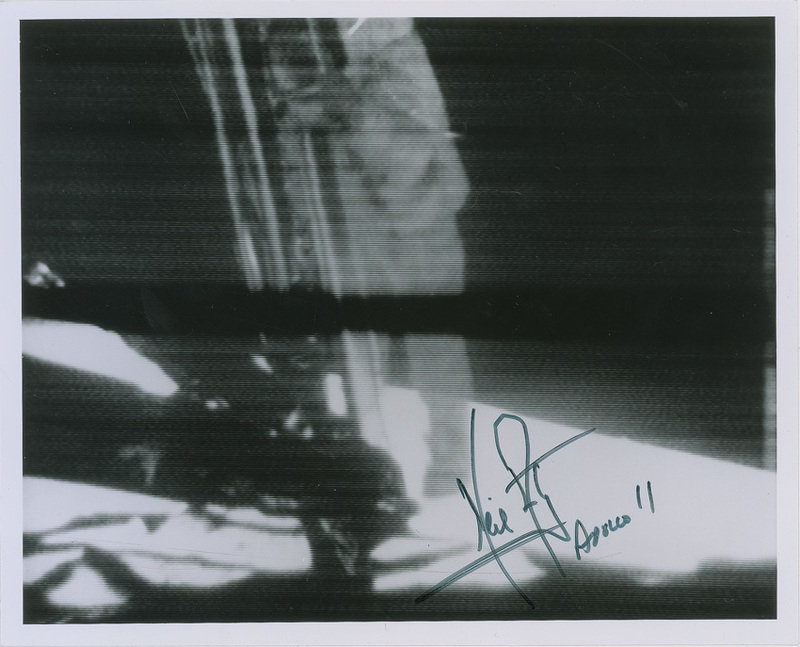 In a RR Auction Space Auction last fall, this Neil Armstrong signed photo closed at $14,350. All that said, I will submit that the most valuable single signed astronaut photo is an unpersonalized white space suit photo signed by an astronaut many generalist collectors may not have heard of before - Jim Irwin. Jim Irwin was the 8th man to walk on the moon with Apollo 15. He was a good signer prior to his untimely death in 1991. He signed many, many items and Irwin signatures can be had for as little as $30 - $50 on postal covers, cards, etc. So, why would he be the most valuable single signed astronaut photo? He hated his NASA white space suit portrait and didn't like signing it. If you sent him one, he would send another signed photo instead. I estimate I see 100 Neil Armstrong signed white space suit portraits for every one Irwin signed white space suit portrait. They are that rare. A handful come to market a year, and even less unpersonalized. Irwin frequently personalized, so unpersonalized examples are exceedingly rare. And what makes this so valuable is many space collectors try to collect the "set" of white space suit portraits. So you have many collectors competing for an extremely rare signed item, even if an Irwin signature itself is very common. Perhaps the finest Jim Irwin signed white space suit photo in existence is currently featured in the RR Auction Fall Space Auction. Not only is it signed perfectly, it boasts an exceptional inscription, "Apollo 15 LMP, 8th moon walker, the chance of a lifetime." As I write this, bidding is up to $7,560 with over 5 days to go. I would not be shocked to see this break $12,000. Interestingly, after I reviewed and approved this item and the auction preview went online, noted collector and dealer Ken Havekotte wrote on CollectSpace that he obtained this directly from Irwin when Irwin visited his Merritt Island, FL, home in July 1987. Havekotte went on to write he sold it many years ago, so apparently he is not the current consignor.